Mail, Calendar, Maps, People and OneNote have grown into useful and feature-filled apps. The touch-friendly apps built into Windows 8 and Windows 10 (originally called Metro apps and now just called Windows apps) were, for a long time, roundly denounced by many reviewers as being underpowered -- and justifiably so. 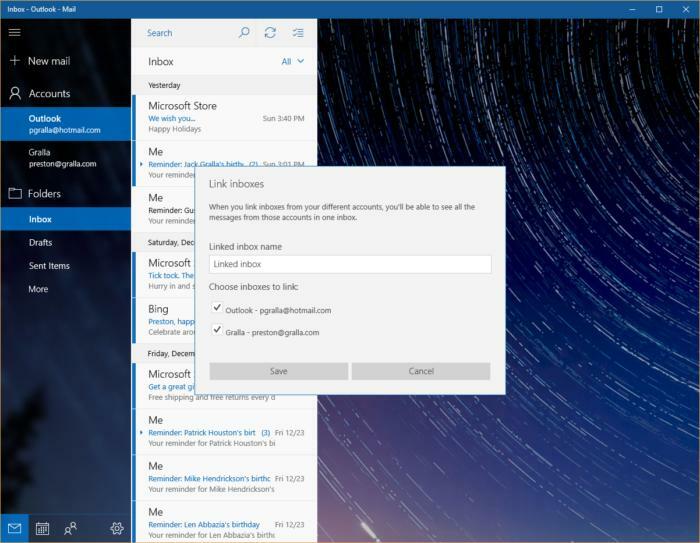 The first release of Mail in Windows 8, for example, didn't have threaded messaging, and the first release of Calendar made it confusing to do something as simple as changing the view to a day, week or month. But over time, something surprising happened. After several updates -- and the merging of the touch-friendly and keyboard-based interfaces in Windows 10 -- some of Microsoft's built-in apps have become well worth using. If you tried and abandoned them in the past, and haven't bothered to check back, it's time to give them another try. Here are five solid apps that ship with Windows 10, along with tips on how to use them. As a bonus, I've listed three special-purpose apps built into Windows you might want to try as well. If you took one look at Mail in Windows 8 and immediately turned away, no one would blame you. It was poorly designed, couldn't handle POP3 mail accounts and had poor text-handling features, among other drawbacks. If you want to do it for all accounts, click the "Apply to all accounts" box. From now on, you'll get alerts in the lower-right of your Windows screen when you get mail. A small icon shows the number of new messages you've received. To read them, just click the icon to launch the Action Center on the right-side of the screen. Click any mail message displayed there to read it. Once you do that, you'll see each of your separate accounts listed under the Accounts icon on the left part of the screen in Mail. Click any to read mail, manage mail, create mail, and so on. If you want to change the default name of the unified inbox (the default is "Linked inbox"), type the new name in the box underneath "Linked inbox name." You'll now see all mail from the linked accounts in a single new account under the name you chose. The new account will include received mail, sent mail and drafts. Note that when you do this, each of the accounts you've linked together (for example Outlook.com and Gmail), won't show up separately in Mail. Instead, they will all be combined in the new account. When you've created a unified inbox in this way, you'll get a choice of which account to use whenever you create and send an email. Right-click the unified account you created and select Account settings. You'll see a list of all the accounts you've linked. 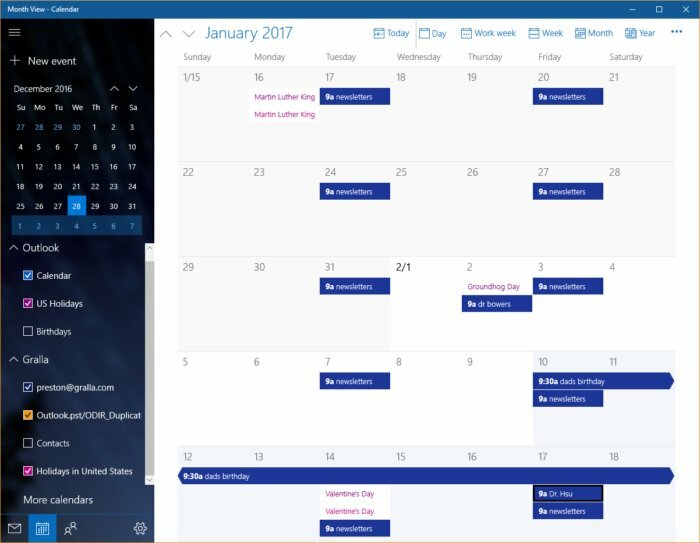 If you remember Calendar from the Windows 8 days -- when doing as something as simple as changing the view to a day, week or month was a confusing task -- you owe it to yourself to check out the latest version. Like Mail, it's gotten a big overhaul. And, as with Mail, you can use it as a unified application, so that if you have multiple calendars you can see all your appointments in one place. Seeing all your events from several calendars on one unified calendar can also be confusing. For example, the Calendar app by default shows the birthdays of your contacts in all your calendars. If you've got multiple calendars, each with lots of associated contacts, your calendar could become littered with way too many birthday listings -- some of them repeated. Click the so-called "hamburger button" (the three horizontal lines) at the top left of the screen. A new pane will appear on the left; at the bottom, you'll see all your calendars. Click the down arrow next to each calendar to see what types of information it shows -- U.S. holidays or birthdays, for example. Uncheck the boxes next to the information you don't want displayed. If you're a Cortana user, you'll be pleased to know that Cortana integrates with Maps. Ask it, "Give me directions to Ithaca, New York," and the Map app will launch, complete with directions. Or ask Cortana to see a map of a city and Maps launches and shows it. There's more to Maps than that, though. If you travel overseas and don't want to have to pay data charges for using maps, you'll find the offline maps feature a big money-saver. Just download maps to your laptop or tablet before you go, and you'll be able to use them at your destination without using data. It's also a great idea if you're in the U.S. and traveling somewhere not in reach of Wi-Fi. Quit the Maps app (you won't be able to download maps while the app is running). On Windows' main screen, select Settings -> System -> Offline Maps -> Download maps. You'll come to a screen that lets you browse through all the continents of the world. From the screen that appears, click the country with the location of the map you want to download. In some instances, the entire map of the country will be downloaded (for, example, Nepal). In others, after you select a country you'll then select a region for the map you want to download -- for example, if I wanted a map of a place in Massachusetts, I would select North and Central America, then USA, then Massachusetts. From now on, if you're in that location without a Wi-Fi connection, you'll be able to access the map offline. 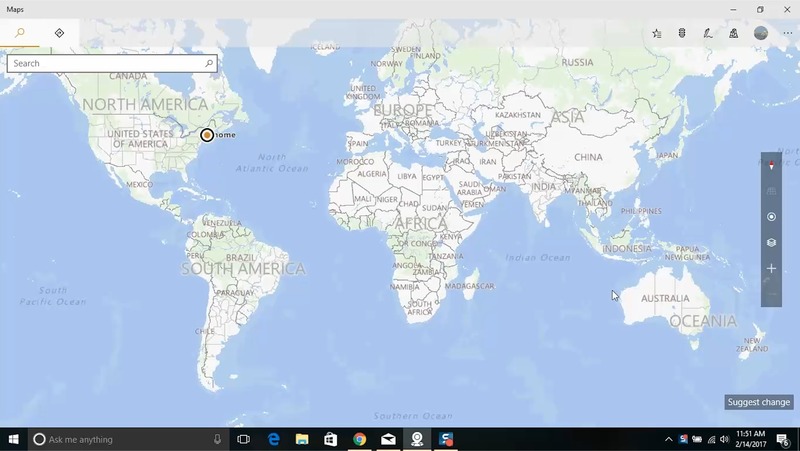 If you're connected to a Wi-Fi network, Windows will use the online version of the map, and automatically update for any changes in that map. Go to Settings -> System -> Offline Maps -> Download maps. You'll find a list of all the maps you've downloaded. Click on any you want to delete. If you want to delete all of them, click the Delete all maps button. The map will be immediately deleted if you're not currently using the Maps app. If you are using the Maps app, it will be deleted the next time you exit the Maps app. 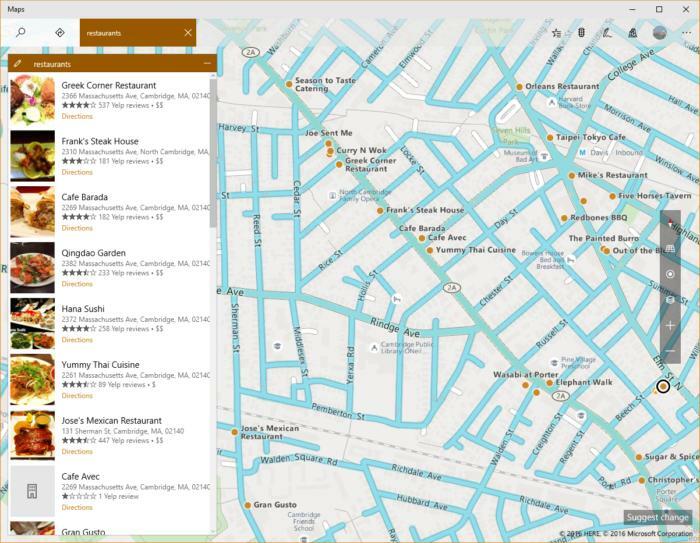 Now, when you're using a map and want to use Streetside, click on a street you want to see, and you will be launched into that view. Look around the location by dragging with a mouse. Move around by clicking where you want to go. The small star icon on the far left lets you save favorite places. Click it and you'll be able to save your home and work locations. It's also worthwhile checking out the 3D cities, which is accessed via the icon on the far right. Select any of the listed cities or browse to others, and you'll get a high-resolution bird's-eye view that you can navigate. The only drawback is the selection of cities available, which seems weird to me -- for example, it includes London, Ontario, but not London, England, and Rennes in France, but not Paris.